I say "leather handled," but there were other sorts of handles made from fibrous washer, canopy plexiglas, brown hard rubber materials and a mix of all sorts including aluminum and brass washers. Inventiveness and ingenuity has always been the trait of a good fighting man. Some of them are very professionally made and others less so. Blades were often fashioned from files, chef's sharpening steels, scraps of metal from airplanes or other equipment. 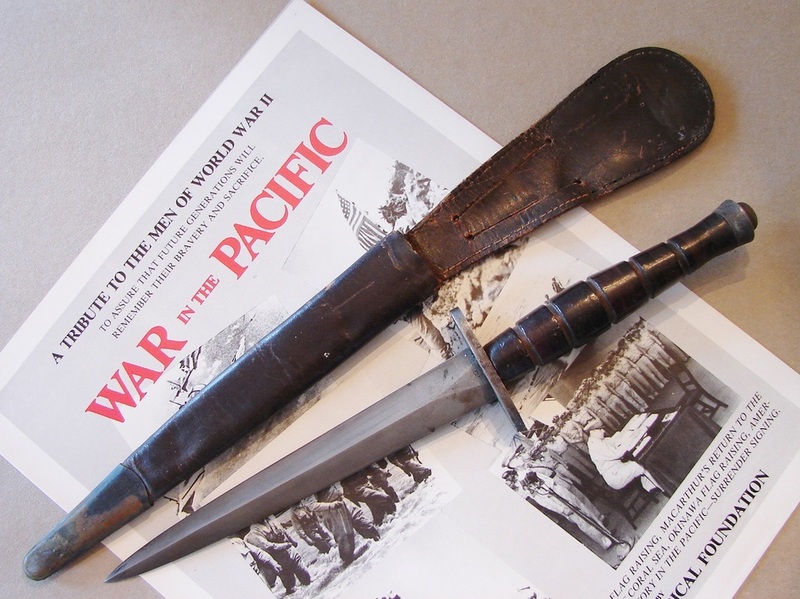 Blades were also made from cut down bayonets and swords of many countries and times. As the old saying goes, "Necessity is the mother of all invention." Below: No doubt this knife is a handmade or Theater Made knife. Whoever made it did an outstanding job on the knife and the sheath. It is World War Two and I would guess American Made but no way to know for sure. So enjoy this lovely little stiletto for what its worth. Its not a Fairbairn but I could not resist buying it. 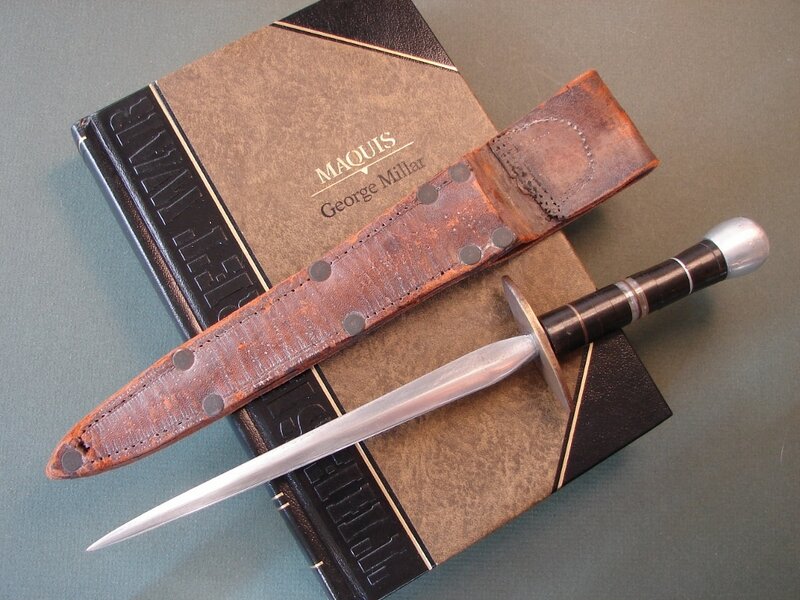 I am looking forward to reading the book, Maquis by Millar. The exploits of the SAS and others working with the Maquis are simply amazing. The Germans were incredibly ruthless and the Agents had to be fearless in their actions knowing that capture would mean torture and death. Below: Illustrated here is a dagger made by a Messr. Peolo. According to my friend Fabrice, Peolo was a knife maker in Algeria. The blade, guard and domed pommel are heavily nickel plated. Deeply forged with two concave sides and one flat side (similar to a French small sword), the wicked blade is 6 3/4 inches long. Compressed leather washers make up the handle. The knife is tight and only missing a top nut with integral lanyard loop. Originally the sheath may have been formed of metal like the 1833 French daggers which this appears to closely duplicate. The end of the tang would have originally has a screw-on nut with lanyard loop. Below: Here is a knife that the seller said he believed was Vietnam era. 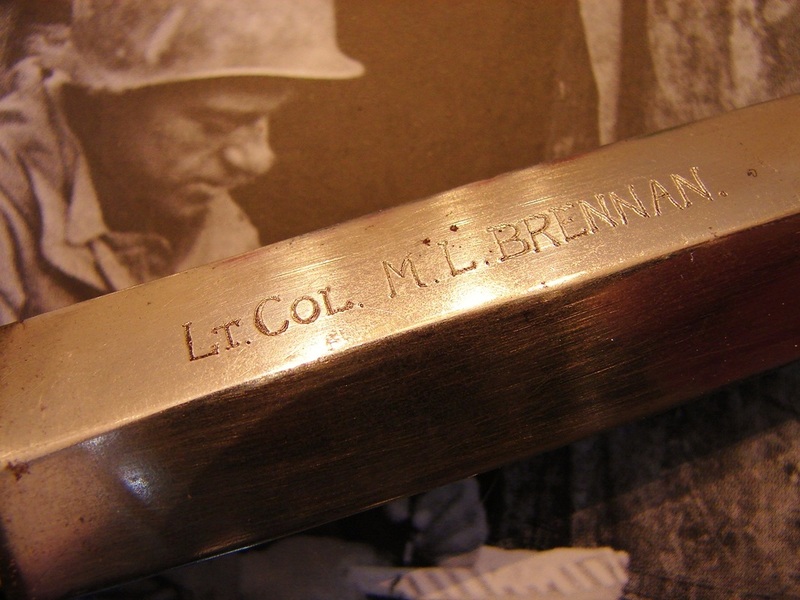 It clearly belonged to a Lt. Col. M. L. Brennan and is appropriately engraved on the blade. There is no clue who the maker was but it is a very professionally made knife. UPDATE: I just discovered the following - Lt. Colonel M.L. Brennan was commander of the 4th Canadian Royal Army Service Corps involved in resupplying the troops in Europe during WW-II. 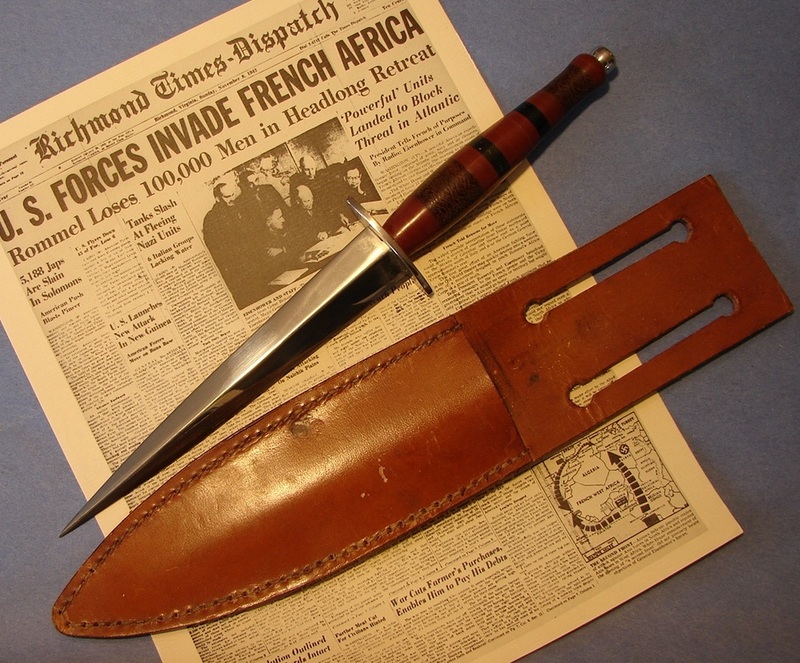 Below: Two typical leather handled knives made by Taylor, "Eye Witness" Sheffield, England are illustrated below. One of them is in its original leather sheath. 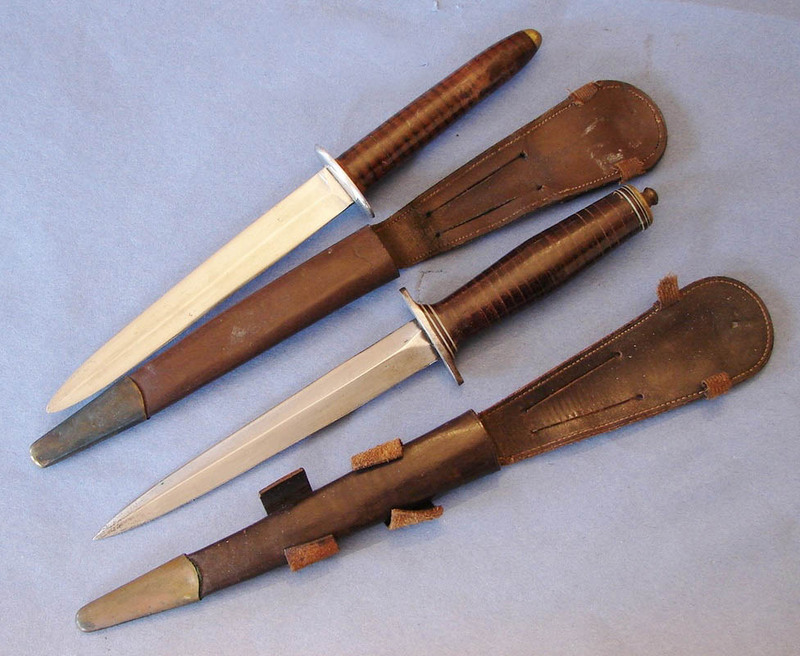 These knives are considered late-war and/or private purchase by many collectors. 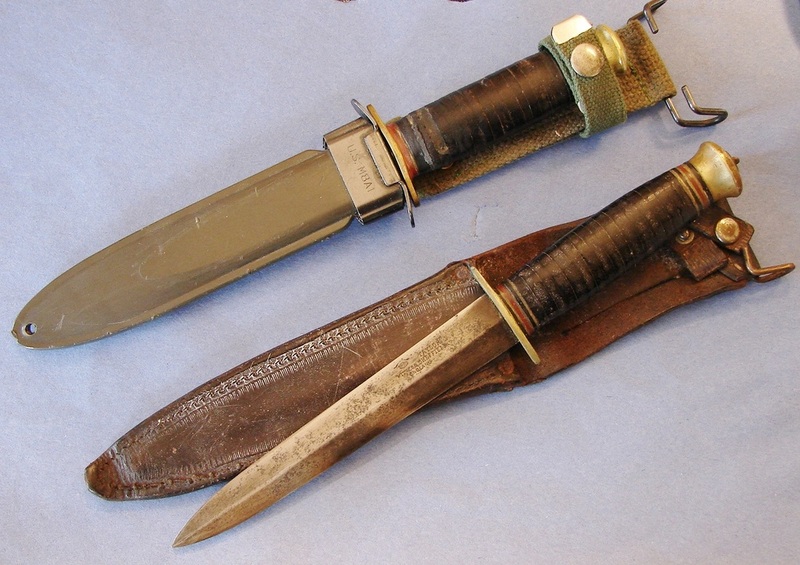 Both sheaths have the metal hanger to attach to an American style web belt, the top knife being in an American bayonet scabbard. 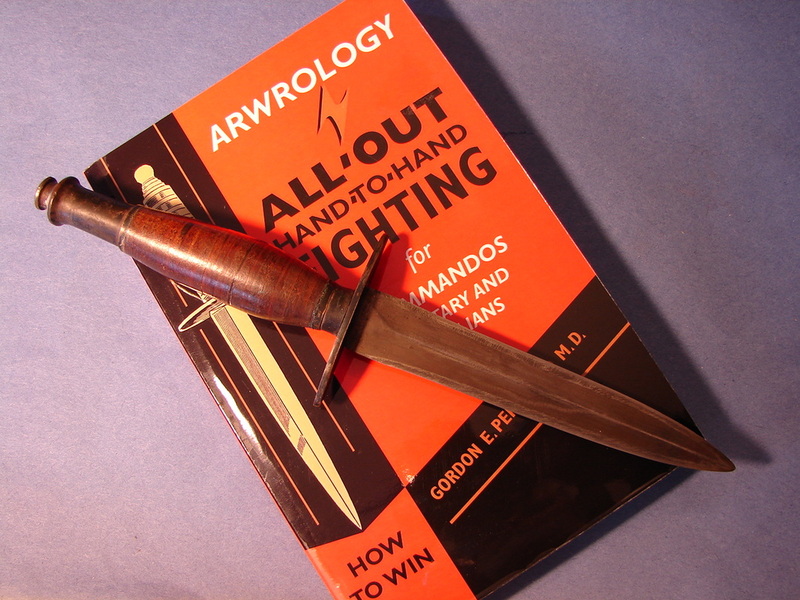 Below: Is this dagger designed by Gordon E. Perrigard M.D. style of combat called Arwrology? It is possible since this handle shape is consistent with that shown in some of the pictures associated with this school. The blade on this knife has been broken and re-tipped making it a little shorter than those illustrated. This unusual knife came out of Canada and has no markings on it. One person noted that it also resembles the original Applegate Randall knife. The thing that makes me think it is not by Randall, is the thin blade stock does not fit with Randall manufacture and it came out of Canada. Two leather handled knives with commando style sheaths. The lower one is built on a P-2 blade and guard and reminds me of a Randall Made knife. The top one appears to be totally hand made. The are both very functional knives and extremely light-weight. 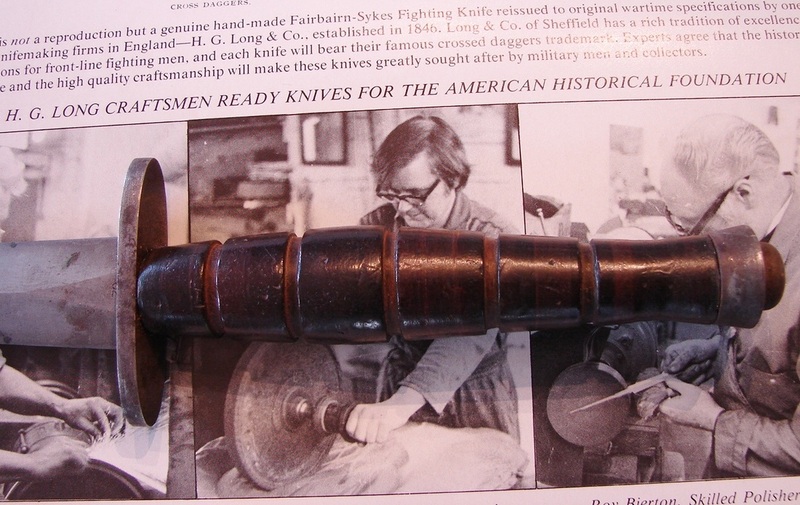 Below: An excellent hand made knife included in Homer Brett's book on bayonets and fighting knives. The handle is in a P-2 shape but made from some type of hard plastic or rubber washers. The well formed guard and top nut are nickle plated. Heavier than a standard P-2, the blade rapidly tapers to a needle-tip, and is expertly ground. It came in this well built but clumsy sheath which appears to have never included any type of retention device or strap. The knife and sheath are in near mint condition. 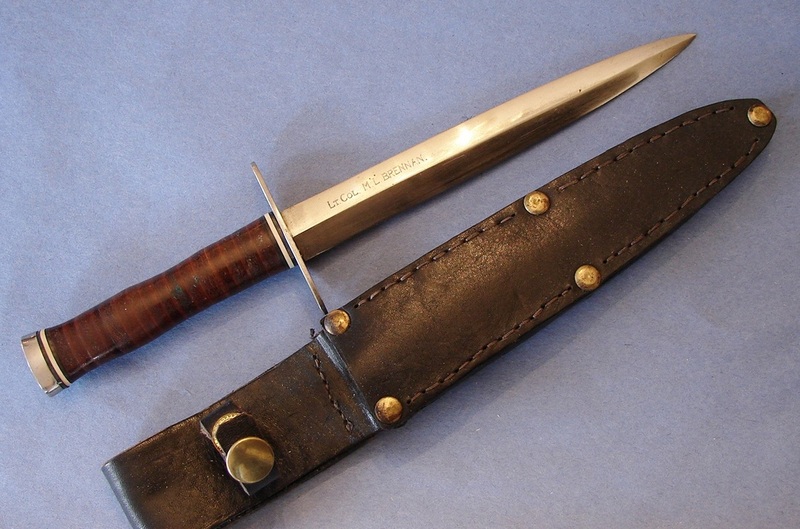 Below: This is the last and best of the leather handled F~S knives currently in our collection. The blade may be from a heavy model P-2 or P-3 and it is bead blasted for a frosted finish. The handle is similar in look to an M-3 or KaBar combat knife with deep grooves cut in the leather washers. The guard and pommel are steel, the guard being typical F~S type only thicker. 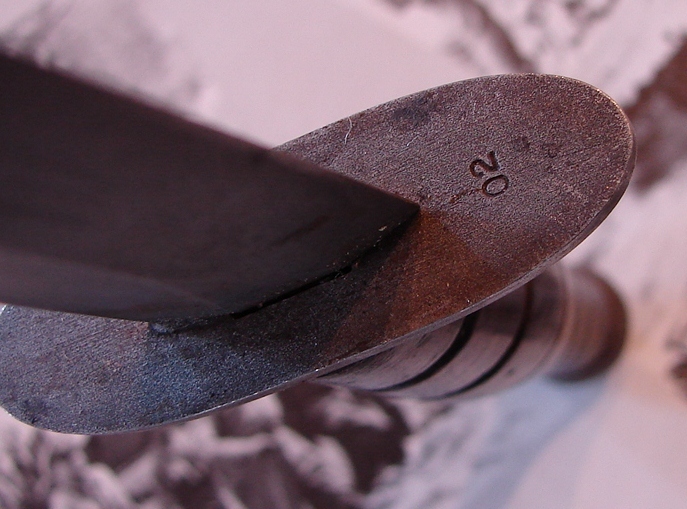 On the under side of the guard, and on the blade, is a tiny crisp stamping "02". Does this mean a second example of a prototype perhaps? If you have any information on who might have made this knife please contact me via our links/contact page.